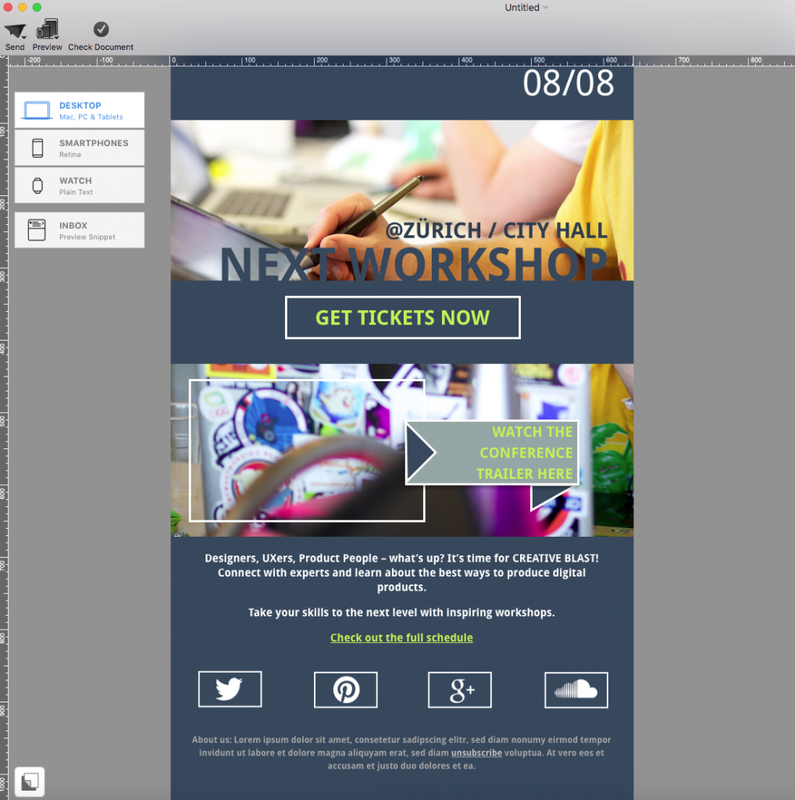 So you’ve finally finished designing your email… Are you ready to hit that launch button? Before you do, we want to share some important elements you should check before you click send. Growing up, your English teachers have probably nagged you to use spell check before you submit your papers. If it still hasn’t come second nature to you, we’ll take this time to nag you one last time. Since you have worked hard to design an awesome email with incredible content, you don’t want your subscribers to be thrown off with spelling errors. Typos can make your emails harder to read, and they can also make you look unprofessional. Although it’s easy to make spelling errors, they are just as easy to correct with spell check. So before you hit that launch button, be sure to use spell check on your document. Check for errors – typos, spacing, etc. Then, ask yourself, “Is the subject line interesting enough? Does it pique my interest me when I read it?” If not, go back to the drawing board and try something different. Personalization: Did you personalize the email? If not, consider adding a name placeholder in the subject line. Personalized emails have a better chance of being noticed. Short and to the point: Don’t exceed more than one line. Your subject line should fit within the number of allotted characters. The goal: your subscribers can easily tell what the email is all about from the subject line. The footer typically contains important legal information such as an unsubscribe link, privacy statement, company address, company phone number, etc. Confirm that all of the information you have entered within the footer are correct and up-to-date. Also, check that the links within the footer are working. You want to make sure that the landing pages to those links are working. This is extremely important when it comes to the unsubscribe landing page. You are legally required to comply with all unsubscribe requests. If possible, use an email service provider with easy list management that automatically removes unsubscribers from your emailing list. For instance, Elite Email and Mailjet both offer automatic unsubscribe compliance feature. Tip: For more detailed information on what to include within your footer, check out our guide on safe email practices. Have you added any links to your social media pages? If you haven’t, this is the perfect time to do so. Generally, you will find social media links at the bottom of the email template. However, feel free to change it up and add them on the top. We just don’t recommend adding them in the middle of your email copy. 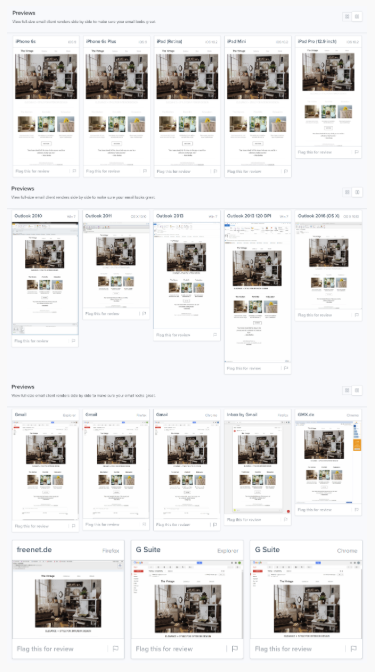 You want to reserve the middle area of your template for your main email messages (like product spotlights, event recap, success stories, etc.). Tip: Try to use icons instead of text hyperlinks. Icons are easier to notice within the template. Also, they look easier to click, especially for mobile-users. Extra tip: Check out our guide on how to properly add different buttons with different links using Mail Designer 365. 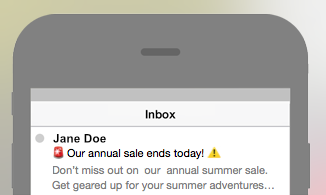 For your text areas, check if you added an email-safe font. It’s best practice to add an email-safe font as a fallback font, in case the recipient does not have the font installed on his or her device. Email-safe fonts are standard fonts that all devices typically come with. 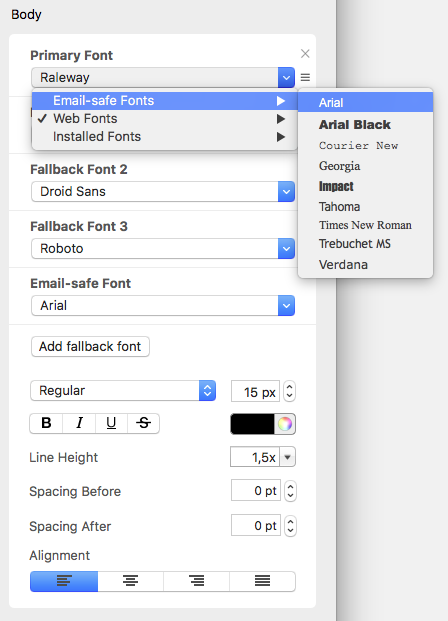 Tip: In Mail Designer 365, you can always choose whichever font you want as the primary font, whether it’s a web font, an email-safe font, or an installed font. However, you can also add an email-safe font as a fallback font. Another important thing to remember when working with images is to add alternative text to your images. In case an image does not show up for a subscriber, it’s good to have an alt-text that will show up instead of an error box. Your alt-text could describe what the image is supposed to be or what a product does. Sometimes, you thought of an awesome sentence to start your email, but the full sentence does not show up. Inbox preview is always a good step to take to ensure that your inbox snippet is not awkwardly cut off. 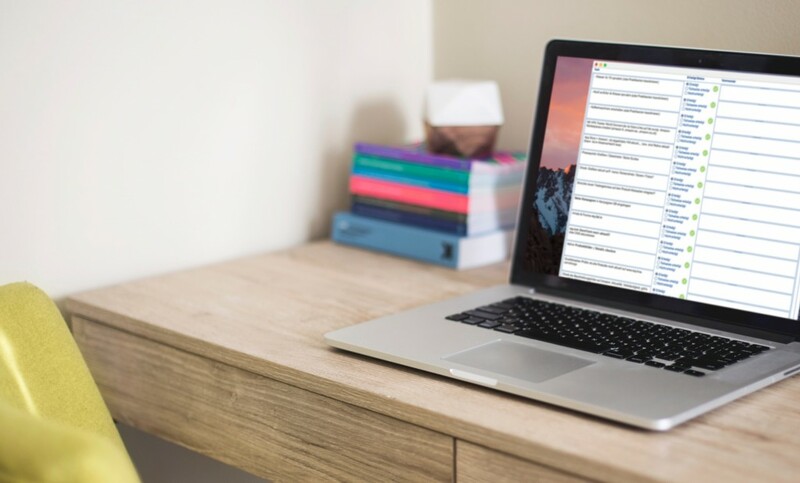 You have the option of re-wording your inbox snippet to get your point across in fewer words. Or you can reorganize the order of your sentence so that the statement before the cut-off still makes sense. 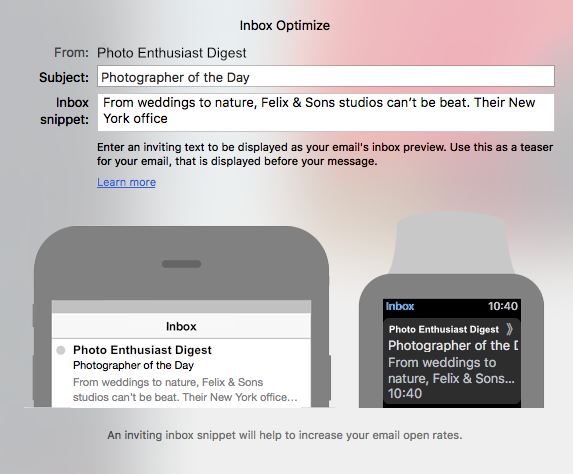 Tip: With Mail Designer 365, you have more control when it comes to the message of your inbox snippet. Just click “Inbox” on the right side of the window. Then, you’re able to edit the inbox preview snippet. If there’s one thing that must be on your pre-flight checklist, it’s testing. Before you launch your email campaign, do an email test. In case something gets skewed on your test email, you’re able to make the necessary adjustments so that your designs will look perfect during launch. Send a test email to yourself and/or to team members. It’s also a great way to get some feedback on your template. Sometimes, other team members may catch a mistake or provide new ideas to improve your newletter. Tip: You can also try Litmus to visualize how your email template will look like on various email clients. This is a great way to test how different email clients read and interpret your email design. For step-by-step instruction on how to use Litmus, feel free to follow our “Checking Your Design on Different Email Clients” guide.